Posted by apetrov in Near Physics, Particle Physics, Physics, Science. There is a big news that came from CERN today. It was announced at a conference called Recontres de Moriond, one of the major yearly conferences in the field of particle physics. One of the CERN’s experiments, LHCb, reported an observation — yes, observation, not an evidence for, but an observation, of CP-violation in charmed system. Why is it big news and why should you care? You should care about this announcement because it has something to do with how our Universe looks like. As you look around, you might notice an interesting fact: everything is made of matter. So what about it? Well, one thing is missing from our everyday life: antimatter. As it turns out, physicists believe that the amount of matter and antimatter was the same after the Universe was created. So, the $1,110,000 question is: what happened to antimatter? According to Sakharov’s criteria for baryonogenesis (a process of creating more baryons, like protons and neutrons, than anti-baryons), one of the conditions for our Universe to be the way it is would be to have matter particles interact slightly differently from the corresponding antimatter particles. In particle physics this condition is called CP-violation. It has been observed in beauty and strange quarks, but never in charm quarks. As charm quarks are fundamentally different from both beauty and strange ones (electrical charge, mass, ways they interact, etc. ), physicists hoped that New Physics, something that we have not yet seen or predicted, might be lurking nearby and can be revealed in charm decays. That is why so much attention has been paid to searches for CP-violation in charm. Now there are indications that the search is finally over: LHCb announced that they observed CP-violation in charm. Here is their announcement (look for a news item from 21 March 2019). A technical paper can be found here, discussing how LHCb extracted CP-violating observables from time-dependent analysis of D -> KK and D-> pipi decays. Experimental result is correct but the theoretical prediction mentioned above is not. Well, theoretical calculations in charm physics are hard and often unreliable, so that theory paper underestimated the result and its uncertainties. Experimental result is incorrect but the theoretical prediction mentioned above is correct. Maybe LHCb underestimated their uncertainties? Experimental result is correct AND the theoretical prediction mentioned above is correct. This is the most interesting outcome: it implies that we see effects of New Physics. What will it be? Time will show. Posted by apetrov in Blogroll, Particle Physics, Physics, Science, Uncategorized. An artist’s impression of electrons orbiting the nucleus. What is the shape of an electron? If you recall pictures from your high school science books, the answer seems quite clear: an electron is a small ball of negative charge that is smaller than an atom. This, however, is quite far from the truth. A simple model of an atom with the nucleus of made of protons, which have a positive charge, and neutrons, which are neutral. The electrons, which have a negative charge, orbit the nucleus. The electron is commonly known as one of the main components of atoms making up the world around us. It is the electrons surrounding the nucleus of every atom that determine how chemical reactions proceed. Their uses in industry are abundant: from electronics and welding to imaging and advanced particle accelerators. Recently, however, a physics experiment called Advanced Cold Molecule Electron EDM (ACME) put an electron on the center stage of scientific inquiry. The question that the ACME collaboration tried to address was deceptively simple: What is the shape of an electron? As far as physicists currently know, electrons have no internal structure – and thus no shape in the classical meaning of this word. In the modern language of particle physics, which tackles the behavior of objects smaller than an atomic nucleus, the fundamental blocks of matter are continuous fluid-like substances known as “quantum fields” that permeate the whole space around us. In this language, an electron is perceived as a quantum, or a particle, of the “electron field.” Knowing this, does it even make sense to talk about an electron’s shape if we cannot see it directly in a microscope – or any other optical device for that matter? To answer this question we must adapt our definition of shape so it can be used at incredibly small distances, or in other words, in the realm of quantum physics. Seeing different shapes in our macroscopic world really means detecting, with our eyes, the rays of light bouncing off different objects around us. Simply put, we define shapes by seeing how objects react when we shine light onto them. While this might be a weird way to think about the shapes, it becomes very useful in the subatomic world of quantum particles. It gives us a way to define an electron’s properties such that they mimic how we describe shapes in the classical world. What replaces the concept of shape in the micro world? Since light is nothing but a combination of oscillating electric and magnetic fields, it would be useful to define quantum properties of an electron that carry information about how it responds to applied electric and magnetic fields. Let’s do that. This is the apparatus the physicists used to perform the ACME experiment. As an example, consider the simplest property of an electron: its electric charge. It describes the force – and ultimately, the acceleration the electron would experience – if placed in some external electric field. A similar reaction would be expected from a negatively charged marble – hence the “charged ball” analogy of an electron that is in elementary physics books. This property of an electron – its charge – survives in the quantum world. Likewise, another “surviving” property of an electron is called the magnetic dipole moment. It tells us how an electron would react to a magnetic field. In this respect, an electron behaves just like a tiny bar magnet, trying to orient itself along the direction of the magnetic field. While it is important to remember not to take those analogies too far, they do help us see why physicists are interested in measuring those quantum properties as accurately as possible. What quantum property describes the electron’s shape? There are, in fact, several of them. The simplest – and the most useful for physicists – is the one called the electric dipole moment, or EDM. In classical physics, EDM arises when there is a spatial separation of charges. An electrically charged sphere, which has no separation of charges, has an EDM of zero. But imagine a dumbbell whose weights are oppositely charged, with one side positive and the other negative. In the macroscopic world, this dumbbell would have a non-zero electric dipole moment. If the shape of an object reflects the distribution of its electric charge, it would also imply that the object’s shape would have to be different from spherical. Thus, naively, the EDM would quantify the “dumbbellness” of a macroscopic object. The story of EDM, however, is very different in the quantum world. There the vacuum around an electron is not empty and still. Rather it is populated by various subatomic particles zapping into virtual existence for short periods of time. The Standard Model of particle physics has correctly predicted all of these particles. If the ACME experiment discovered that the electron had an EDM, it would suggest there were other particles that had not yet been discovered. These virtual particles form a “cloud” around an electron. If we shine light onto the electron, some of the light could bounce off the virtual particles in the cloud instead of the electron itself. This would change the numerical values of the electron’s charge and magnetic and electric dipole moments. Performing very accurate measurements of those quantum properties would tell us how these elusive virtual particles behave when they interact with the electron and if they alter the electron’s EDM. Most intriguing, among those virtual particles there could be new, unknown species of particles that we have not yet encountered. To see their effect on the electron’s electric dipole moment, we need to compare the result of the measurement to theoretical predictions of the size of the EDM calculated in the currently accepted theory of the Universe, the Standard Model. So far, the Standard Model accurately described all laboratory measurements that have ever been performed. Yet, it is unable to address many of the most fundamental questions, such as why matter dominates over antimatter throughout the universe. The Standard Model makes a prediction for the electron’s EDM too: it requires it to be so small that ACME would have had no chance of measuring it. But what would have happened if ACME actually detected a non-zero value for the electric dipole moment of the electron? View of the Large Hadron Collider in its tunnel near Geneva, Switzerland. In the LHC two counter-rotating beams of protons are accelerated and forced to collide, generating various particles. Theoretical models have been proposed that fix shortcomings of the Standard Model, predicting the existence of new heavy particles. These models may fill in the gaps in our understanding of the universe. To verify such models we need to prove the existence of those new heavy particles. This could be done through large experiments, such as those at the international Large Hadron Collider (LHC) by directly producing new particles in high-energy collisions. Alternatively, we could see how those new particles alter the charge distribution in the “cloud” and their effect on electron’s EDM. Thus, unambiguous observation of electron’s dipole moment in ACME experiment would prove that new particles are in fact present. That was the goal of the ACME experiment. This is the reason why a recent article in Nature about the electron caught my attention. Theorists like myself use the results of the measurements of electron’s EDM – along with other measurements of properties of other elementary particles – to help to identify the new particles and make predictions of how they can be better studied. This is done to clarify the role of such particles in our current understanding of the universe. What should be done to measure the electric dipole moment? We need to find a source of very strong electric field to test an electron’s reaction. One possible source of such fields can be found inside molecules such as thorium monoxide. This is the molecule that ACME used in their experiment. Shining carefully tuned lasers at these molecules, a reading of an electron’s electric dipole moment could be obtained, provided it is not too small. However, as it turned out, it is. Physicists of the ACME collaboration did not observe the electric dipole moment of an electron – which suggests that its value is too small for their experimental apparatus to detect. This fact has important implications for our understanding of what we could expect from the Large Hadron Collider experiments in the future. Interestingly, the fact that the ACME collaboration did not observe an EDM actually rules out the existence of heavy new particles that could have been easiest to detect at the LHC. This is a remarkable result for a tabletop-sized experiment that affects both how we would plan direct searches for new particles at the giant Large Hadron Collider, and how we construct theories that describe nature. It is quite amazing that studying something as small as an electron could tell us a lot about the universe. A short animation describing the physics behind EDM and ACME collaboration’s findings. Posted by apetrov in Blogroll, Education, Near Physics, Physics, Science. Some of you might remember my previous post about non-linear teaching, where I described a new teaching strategy that I came up with and was about to implement in teaching my undergraduate Classical Mechanics I class. Here I want to report on the outcomes of this experiment and share some of my impressions on teaching. Our Classical Mechanics class is a gateway class for our physics majors. It is the first class they take after they are done with general physics lectures. So the students are already familiar with the (simpler version of the) material they are going to be taught. The goal of this class is to start molding physicists out of physics students. It is a rather small class (max allowed enrollment is 20 students; I had 22 in my class), which makes professor-student interaction rather easy. To motivate the method that I proposed, I looked at some studies in experimental psychology, in particular in memory and learning studies. What I was curious about is how much is currently known about the process of learning and what suggestions I can take from the psychologists who know something about the way our brain works in retaining the knowledge we receive. As it turns out, there are some studies on this subject (I have references, if you are interested). The earliest ones go back to 1880’s when German psychologist Hermann Ebbinghaus hypothesized the way our brain retains information over time. The “forgetting curve” that he introduced gives approximate representation of information retention as a function of time. His studies have been replicated with similar conclusions in recent experiments. The upshot of these studies is that loss of learned information is pretty much exponential; as can be seen from the figure on the left, in about a day we only retain about 40% of what we learned. Psychologists also learned that one of the ways to overcome the loss of information is to (meaningfully) retrieve it: this is how learning happens. Retrieval is critical for robust, durable, and long-term learning. It appears that every time we retrieve learned information, it becomes more accessible in the future. It is, however, important how we retrieve that stored information: simple re-reading of notes or looking through the examples will not be as effective as re-working the lecture material. It is also important how often we retrieve the stored info. So, here is what I decided to change in the way I teach my class in light of the above-mentioned information (no pun intended). To counter the single-day information loss, I changed the way homework is assigned: instead of assigning homework sets with 3-4-5 problems per week, I introduced two types of homework assignments: short homeworks and projects. Short homework assignments are single-problem assignments given after each class that must be done by the next class. They are designed such that a student needs to re-derive material that was discussed previously in class (with small new twist added). For example, if the block-down-to-incline problem was discussed in class, the short assignment asks to redo the problem with a different choice of coordinate axes. This way, instead of doing an assignment in the last minute at the end of the week, the students are forced to work out what they just learned in class every day (meaningful retrieval)! The second type of assignments, project homework assignments are designed to develop understanding of how topics in a given chapter relate to each other. There are as many project assignments as there are chapters. Students get two weeks to complete them. At the end, the students get to solve approximately the same number of problems over the course of the semester. For a professor, the introduction of short homework assignments changes the way class material is presented. Depending on how students performed on the previous short homework, I adjusted the material (both speed and volume) that we discussed in class. I also designed examples for the future sections in such a way that I could repeat parts of the topic that posed some difficulties in comprehension. Overall, instead of a usual “linear” propagation of the course, we moved along something akin to helical motion, returning and spending more time on topics that students found more difficult (hence “rapid-response or non-linear” teaching). Other things were easy to introduce: for instance, using Socrates’ method in doing examples. The lecture itself was an open discussion between the prof and students. So, I have implemented this method in teaching Classical Mechanics I class in Fall 2017 semester. It was not an easy exercise, mostly because it was the first time I was teaching this class and had no grader help. I would say the results confirmed my expectations: introduction of short homework assignments helps students to perform better on the exams. Now, my statistics is still limited: I only had 20 students in my class. Yet, among students there were several who decided to either largely ignore short homework assignments or did them irregularly. They were given zero points for each missed short assignment. All students generally did well on their project assignments, yet there appears some correlation (see graph above) between the total number of points acquired on short homework assignments and exam performance (measured by a total score on the Final and two midterms). This makes me thing that short assignments were beneficial for students. I plan to teach this course again next year, which will increase my statistics. I was quite surprised that my students generally liked this way of teaching. In fact, they were disappointed that I decided not to apply this method for the Mechanics II class that I am teaching this semester. They also found that problems assigned in projects were considerably harder than the problems from the short assignments (this is how it was supposed to be). For me, this was not an easy semester. I had to develop my set of lectures — so big thanks go to my colleagues Joern Putschke and Rob Harr who made their notes available. I spent a lot of time preparing this course, which, I think, affected my research outcome last semester. Yet, most difficulties are mainly Wayne State-specifics: Wayne State does not provide TAs for small classes, so I had to not only design all homework assignments, but also grade them (on top of developing the lectures from the ground up). During the semester, it was important to grade short assignments in the same day I received them to re-tune lectures, this did take a lot of my time. I would say TAs would certainly help to run this course — so I’ll be applying for some internal WSU educational grants to continue development of this method. I plan to employ it again next year to teach Classical Mechanics. Posted by apetrov in Blogroll, Physics, Science. I wanted to share some ideas about a teaching method I am trying to develop and implement this semester. Please let me know if you’ve heard of someone doing something similar. This semester I am teaching our undergraduate mechanics class. This is the first time I am teaching it, so I started looking into a possibility to shake things up and maybe apply some new method of teaching. And there are plenty offered: flipped classroom, peer instruction, Just-in-Time teaching, etc. They all look to “move away from the inefficient old model” where there the professor is lecturing and students are taking notes. I have things to say about that, but not in this post. It suffices to say that most of those approaches are essentially trying to make students work (both with the lecturer and their peers) in class and outside of it. At the same time those methods attempt to “compartmentalize teaching” i.e. make large classes “smaller” by bringing up each individual student’s contribution to class activities (by using “clickers”, small discussion groups, etc). For several reasons those approaches did not fit my goal this semester. Our Classical Mechanics class is a gateway class for our physics majors. It is the first class they take after they are done with general physics lectures. So the students are already familiar with the (simpler version of the) material they are going to be taught. The goal of this class is to start molding physicists out of students: they learn to simplify problems so physics methods can be properly applied (that’s how “a Ford Mustang improperly parked at the top of the icy hill slides down…” turns into “a block slides down the incline…”), learn to always derive the final formula before plugging in numbers, look at the asymptotics of their solutions as a way to see if the solution makes sense, and many other wonderful things. So with all that I started doing something I’d like to call non-linear teaching. The gist of it is as follows. I give a lecture (and don’t get me wrong, I do make my students talk and work: I ask questions, we do “duels” (students argue different sides of a question), etc — all of that can be done efficiently in a class of 20 students). But instead of one homework with 3-4 problems per week I have two types of homework assignments for them: short homeworks and projects. Short homework assignments are single-problem assignments given after each class that must be done by the next class. They are designed such that a student need to re-derive material that we discussed previously in class with small new twist added. For example, in the block-down-to-incline problem discussed in class I ask them to choose coordinate axes in a different way and prove that the result is independent of the choice of the coordinate system. Or ask them to find at which angle one should throw a stone to get the maximal possible range (including air resistance), etc. This way, instead of doing an assignment in the last minute at the end of the week, students have to work out what they just learned in class every day! More importantly, I get to change how I teach. Depending on how they did on the previous short homework, I adjust the material (both speed and volume) discussed in class. I also design examples for the future sections in such a way that I can repeat parts of the topic that was hard for the students previously. Hence, instead of a linear propagation of the course, we are moving along something akin to helical motion, returning and spending more time on topics that students find more difficult. That’t why my teaching is “non-linear”. Project homework assignments are designed to develop understanding of how topics in a given chapter relate to each other. There are as many project assignments as there are chapters. Students get two weeks to complete them. Overall, students solve exactly the same number of problems they would in a normal lecture class. Yet, those problems are scheduled in a different way. In my way, students are forced to learn by constantly re-working what was just discussed in a lecture. And for me, I can quickly react (by adjusting lecture material and speed) using constant feedback I get from students in the form of short homeworks. Win-win! I will do benchmarking at the end of the class by comparing my class performance to aggregate data from previous years. I’ll report on it later. But for now I would be interested to hear your comments! Posted by apetrov in Uncategorized. 30 years ago, on 26 April 1986, the biggest nuclear accident happened at the Chernobyl nuclear power station. The title says it all. Today, The Light Interferometer Gravitational-Wave Observatory (or simply LIGO) collaboration announced the detection of gravitational waves coming from the merger of two black holes located somewhere in the Southern sky, in the direction of the Magellanic Clouds. In the presentation, organized by the National Science Foundation, David Reitze (Caltech), Gabriela Gonzales (Louisiana State), Rainer Weiss (MIT), and Kip Thorn (Caltech), announced to the room full of reporters — and thousand of scientists worldwide via the video feeds — that they have seen a gravitational wave event. Their paper, along with a nice explanation of the result, can be seen here. The data that they have is rather remarkable. 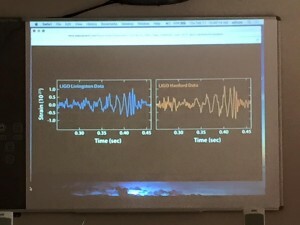 The event, which occurred on 14 September 2015, has been seen by two sites (Livingston and Hanford) of the experiment, as can be seen in the picture taken from their presentation. It likely happened over a billion years ago (1.3B light years away) and is consistent with the merger of two black holes, of 29 and 46 solar masses. The resulting larger black hole’s mass is about 62 solar masses, which means that about 3 solar masses of energy (29+36-62=3) has been radiated in the form of gravitational waves. This is a huge amount of energy! The shape of the signal is exactly what one should expect from the merging of two black holes, with 5.1 sigma significance. It is interesting to note that the information presented today totally confirms the rumors that have been floating around for a couple of months. Physicists like to spread rumors, as it seems. Since the gravitational waves are quadrupole, the most straightforward way to see the gravitational waves is to measure the relative stretches of the its two arms (see another picture from the MIT LIGO site) that are perpendicular to each other. Gravitational wave from black holes falling onto each other and then merging. The LIGO device is a marble of engineering — one needs to detect a signal that is very small — approximately of the size of the nucleus on the length scale of the experiment. This is done with the help of interferometry, where the laser beams bounce through the arms of the experiment and then are compared to each other. The small change of phase of the beams can be related to the change of the relative distance traveled by each beam. This difference is induced by the passing gravitational wave, which contracts one of the arms and extends the other. The way noise that can mimic gravitational wave signal is eliminated should be a subject of another blog post. This is really a remarkable result, even though it was widely expected since the (indirect) discovery of Hulse and Taylor of binary pulsar in 1974! It seems that now we have another way to study the Universe. So, the Nobel Prize in Physics 2015 has been announced. To much surprise of many (including the author), it was awarded jointly to Takaaki Kajita and Arthur B. McDonald “for the discovery of neutrino oscillations, which shows that neutrinos have mass.” Well deserved Nobel Prize for a fantastic discovery. What is this Nobel prize all about? Some years ago (circa 1997) there were a couple of “deficit” problems in physics. First, it appeared that the detected number of (electron) neutrinos coming form the Sun was measured to be less than expected. This could be explained in a number of ways. First, neutrino could oscillate — that is, neutrinos produced as electron neutrinos in nuclear reactions in the Sun could turn into muon or tau neutrinos and thus not be detected by existing experiments, which were sensitive to electron neutrinos. This was the most exciting possibility that ultimately turned out to be correct! But it was by far not the only one! For example, one could say that the Standard Solar Model (SSM) predicted the fluxes wrong — after all, the flux of solar neutrinos is proportional to core temperature to a very high power (~T25 for 8B neutrinos, for example). So it is reasonable to say that neutrino flux is not so well known because the temperature is not well measured (this might be disputed by solar physicists). Or something more exotic could happen — like the fact that neutrinos could have large magnetic moment and thus change its helicity while propagating in the Sun to turn into a right-handed neutrino that is sterile. As it turned out, the NC flux was exactly what SSM predicted, while the CC flux was smaller. Hence the conclusion that electron neutrinos would oscillate into other types of neutrinos! As can be seen from the above figure, one would expect to have 2 muon-flavored neutrinos per one electron-flavored one. This is not what Super K experiment (T. Kajita) saw — the ratio really changed with angle — that is, the ratio of neutrino fluxes from above would differ substantially from the ratio from below (this would describe neutrinos that went through the Earth and then got into the detector). The solution was again neutrino oscillations – this time, muon neutrinos oscillated into the tau ones. The presence of neutrino oscillations imply that they have (tiny) masses — something that is not predicted by minimal Standard Model. So one can say that this is the first indication of physics beyond the Standard Model. And this is very exciting. I think it is interesting to note that this Nobel prize might help the situation with funding of US particle physics research (if anything can help…). It shows that physics has not ended with the discovery of the Higgs boson — and Fermilab might be on the right track to uncover other secrets of the Universe. So, once again, the Nobel week is upon us. And one of the topics of conversations for the “water cooler chat” in physics departments around the world is speculations on who (besides the infamous Hungarian “physicist” — sorry for the insider joke, I can elaborate on that if asked) would get the Nobel Prize in physics this year. What is your prediction? With invention of various metrics for “measuring scientific performance” one can make educated guesses — and even put predictions on the industrial footage — see Thomson Reuters predictions based on a number of citations (they did get the Englert-Higgs prize right, but are almost always off). Or even try your luck with on-line betting (sorry, no link here — I don’t encourage this). So there is a variety of ways to make you interested. My predictions for 2015: Vera Rubin for Dark Matter or Deborah Jin for fermionic condensates. But you must remember that my record is no better than that of Thomson Reuters. A phrase from William Shakespeare’s Romeo and Juliet states: “What’s in a name? That which we call a rose By any other name would smell as sweet.” This cannot be any further from the truth in the corporate world. The name of a corporation is its face, so setting a brand requires a lot of work and money. But what happens when something goes wrong? The way to deal with corporate problems often involves re-branding, changing the name and the face of the corporation. It works as customers usually do not check the history of a company before buying its products or using its services. It simply works. Posted by apetrov in Blogroll, Near Physics, Physics, Science. Every seven years or so a professor in a US/Canadian University can apply for a sabbatical leave. It’s a very nice thing: your University allows you to catch up on your research, learn new techniques, write a book, etc. That is to say, you become a postdoc again. And in many cases questions arise: should I stay at my University or go somewhere else? In many cases yearlong sabbaticals are not funded by the home University, i.e. you have to find additional sources of funding to keep your salary. I am on a year-long sabbatical this academic year. So I had to find a way to fund my sabbatical (my University only pays 60% of my salary). I spent Fall 2014 semester at Fermilab and am spending Winter 2015 semester at the University of Michigan, Ann Arbor. Here are some helpful resources for those who are looking to fund their sabbatical next year. As you could see from the list, they are slightly tilted towards theoretical physics. Yet, there are many resources that are useful for any profession. Of course your success depends on many factors: whether or not you would like to stay in the US or go abroad, competition, etc. Some general info that could also be useful can be found here. I don’t pretend to have a complete list, but those sites were useful for me. I did not apply to all of those programs — and rather unfortunately, missed a deadline for the Simons Fellowship. Many University also have separate funds for sabbatical visitors. So if there is a University one wants to visit, it’s best to ask. I am an Associate Professor of Physics at Wayne State University (Detroit, USA). My research is in the field of the theoretical high energy physics.